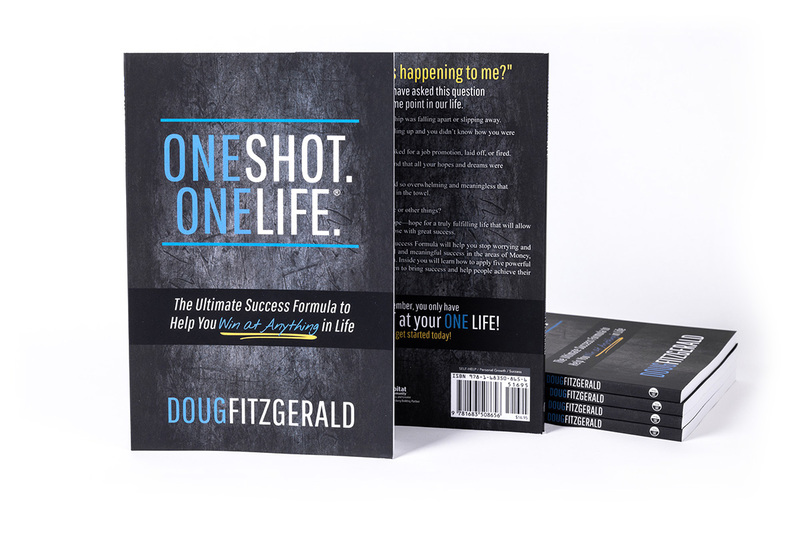 "If you want to make a serious change in your life, ONESHOT. ONELIFE.® provides an excellent set of principles, action steps and planning worksheets to guide your change process. Doug emphasizes that planning is not enough. Persistent action and courage are critical to accomplish your priorities. He also focuses on the importance of having continuous evaluation and a support group. Anyone implementing these concepts will have all the tools to make significant change in any aspect of life: relationships, business, financial, religion or health." "This book is exactly what I needed. I love that it requires us to take action and isn’t just a book to read, digest and then shelve. For me, this feels like a reference to keep out and available to remind myself WHY I do what I do. And I love that it points back to God each and every time. Loving God and loving others." "I'd describe this as a "textbook for success!" Definitely one of the most interesting and valuable books I have ever read. I also love how the worksheets are incorporated into the book. This gives the reader something tangible to work with, giving them the ability to take what they learn and put it into action right away!" “Wisdom comes with age and experience but when it relates to Doug, I feel wisdom comes from perspective. How we look at a specific situation in our lives will greatly impact the outcome. I truly appreciate the perspective Doug brings to our conversations. You'd be wise to allow him to speak into your life as well." "Doug! I’m reading your awesome book and I could not put it down." “The two main reasons the Mastermind had such an impact on my life was the rhythm register that ultimately created habits that changed the trajectory of my life for the good. Layered on top of that, or alongside that, was the healthy accountability the men in the group provided." "ONESHOT. ONELIFE.® ignited a fresh passion in me. These simple principles have helped me finally put my life on a track for success." “Focus and follow through. Two behaviors that tend to be my achilles heel. Working with others in the Mastermind Group helped modify my behavior. I now direct my future as opposed to flowing into it with reckless abandon. The members of our group care about me and my progression in both my personal and business life. The goal setting and all around life balance I have attained are priceless." "As I read this book, I continually reflected on my own life and how I am living it. Overall, this book delivers highly valuable information in a simple way that everyone can understand. This is a book that facilitates success and I can't wait to share it!" “Doug has really challenged me. He helped me believe in myself and in my business. When we talk, he always brings fresh ideas while keeping me focused on the matter at hand. I highly recommend him as a mentor, friend and coach." “I enjoyed the accountability from the Mastermind Group. Simply knowing at each meeting folks were going to ask for an update on how I was doing. That in and of itself was enough motivation. A group that truly cared whether or not I was fulfilling on the goals I had set out to accomplish." “The members of our group care about me and my progression in both my personal and business life. The goal setting and all around life balance I have attained are priceless." “Going through the Mastermind Group made me a better man, husband, and business owner. Being able to share and learn from other respected members of the group was invaluable. The takeaways I learned from the group helped solidify my business financially; which led to me being more present in my marriage and a more fulfilled life." Don’t miss out! Stay up-to-date on all the latest happenings at ONESHOT. ONELIFE.® by joining our FREE Ultimate Success Formula Email Community! Fill out the info below to join. And, connect with us on social media at the links below.